If you want your lawn to look amazing we’re a great choice! You want a beautiful looking and well kept lawn but you just don’t have the time, equipment, or desire to care for it on your own? This is common, but a beautiful lawn doesn’t get that way out of sheer will. It takes time, dedication, and know-how to care for a lawn so it always looks great. 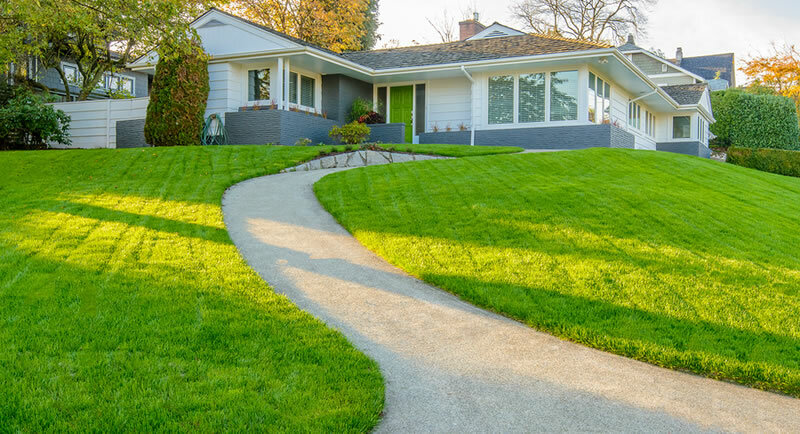 If you want one of the best looking lawns on your street or you have a commercial property you want to look inviting and well-cared for then hiring a lawn care professional is a must. Why Do You Need A Professional Lawn Care Company? Are you embarrassed by your unkept or unhealthy lawn? Do you get poor service from your current lawn care provider? You want a beautiful lawn but lack the time to care for it? Are you unsure how to properly care for your lawn? You have a high visibility property you want to look amazing? Green Acres Lawn & Landscape is a licensed and insured Kansas City lawn care and lawn maintenance company that specializes in lawn care for property of all sizes. Whether you need your lawn mowed on a regular basis or you’d like a complete turn-key lawn care solution for an HOA or commercial property we’ll be able to help you. We provide complete “turn-key” lawn care packages for our residential and commercial customers that are tailored specifically to their properties needs and their budget. We can offer regular services such as mowing, trimming, and edging. We can also take care of seasonal fertilizing, weed control, and seasonal yard clean ups in the spring and fall. You’ll have a beautiful lawn and you won’t have to lift a finger. We listen to your requirements, making any necessary suggestions. We walk your property/grounds and determine the scope of work. Our team will show up on the scheduled day(s) (weather can cause delays) and we’ll care for your lawn as promised. To give you an accurate estimate we’ll need to visit your property and discuss your lawn and landscaping vision for your property. The final cost of our total lawn care packages will be determined by the size of your property, the nature of the services we’re performing and how frequently they will be required. If you’d like to get an estimate for regular lawn care services on your property please give us a call (913) 422-5111 or fill out our online contact form and we’ll get back to you right away.